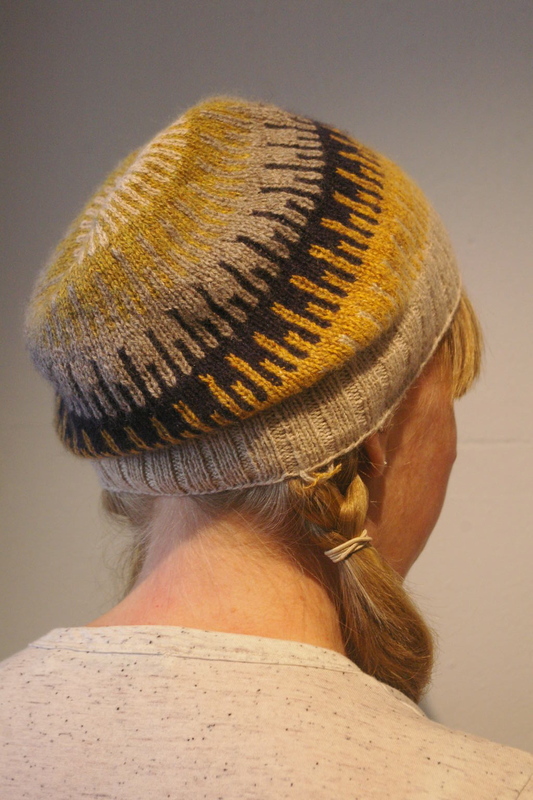 For this design, she used two Shibui yarns, Cima and Pebble, and knitted them held double on 3.5mm needles, ending up with a 6ply tension; for the cast-on and chevron highlights (and that gorgeous pompom! ), she held together two strands of Cima in Jumpsuit and, for the body, a strand of Cima in Fjord and one of Pebble in Ivory. One of the beautiful things about using more than two or more strands of Shibui (and other fine yarns) together is that you never know how the two yarns will work together- the combination is often quite different to both individual yarns! In the case of Kylie’s hat, the two strands of Cima, a smooth alpaca/ merino blend that feels quite light and drapey, resulted a surprisingly plump and bouncy fabric with lovely stitch clarity, whereas the combination of Cima and Pebble resulted in a super-comfy, lightweight hat with a subtle fuzzy halo. This design uses 5 different shades of Pebble and Amy took inspiration from another knitter for her colours- we love Ravelry for so many reasons but especially for sharing all the awesome talent of others! 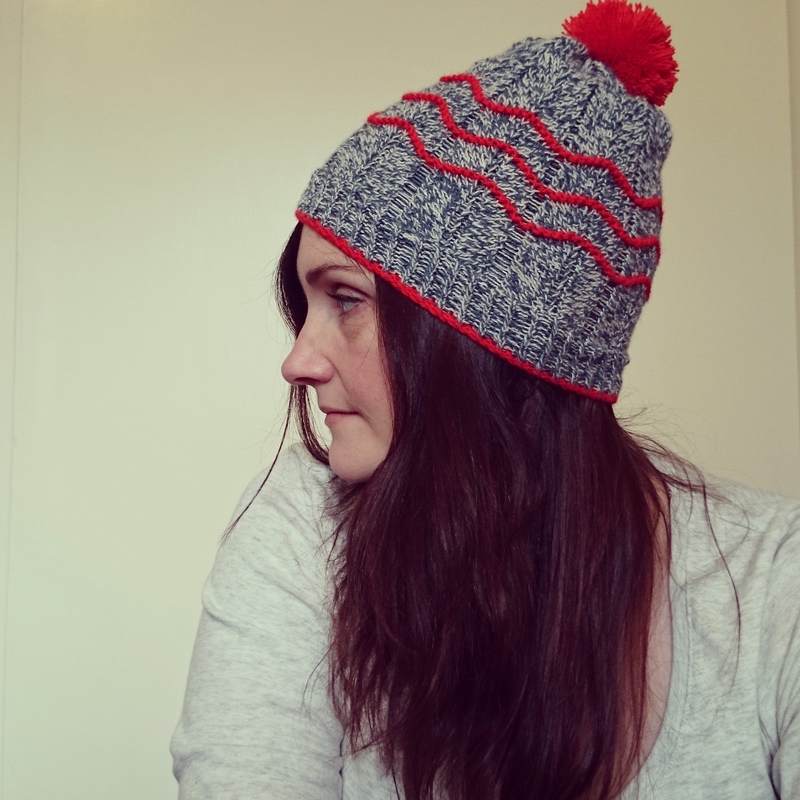 The yarn is held double (two strands of the same colour) and knitted on a 2.75mm needle for the main colourwork body of the hat. Amy found the Pebble really lovely to work with and that the lightness and softness of the merino and cashmere content combined well with the strength of recycled silk to create a soft, lightweight hat with a nice little bloom after blocking. 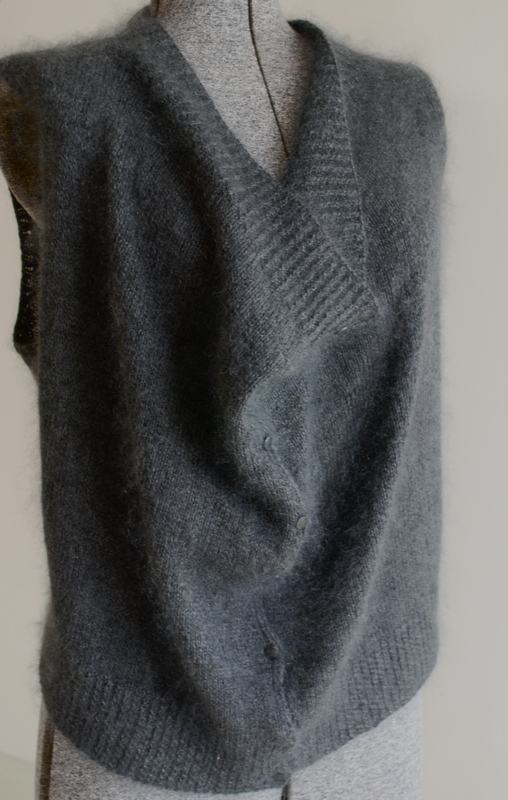 This lovely design really needs a soft, supple fabric to allow the vest and its cowl neckline to drape properly and holding together one strand of Silk Cloud and one of Pebble (both in Ash) has definitely achieved that. The Pebble creates the structure for the garment, while the super-soft kid mohair and silk combo of Silk Cloud makes this lightweight (the garment only weighs 170gm) but incredibly warm and very snuggly! And here is a sneak peak of Jackie’s beautifully neat little mitred squares that she is working using two strands of Pebble; they’ll be sewn together to make a beautiful, warm winter scarf/ wrap. Hurry up, Jackie- we can’t wait to see it finished! We’d love to see and hear what you’re planning with Shibui! 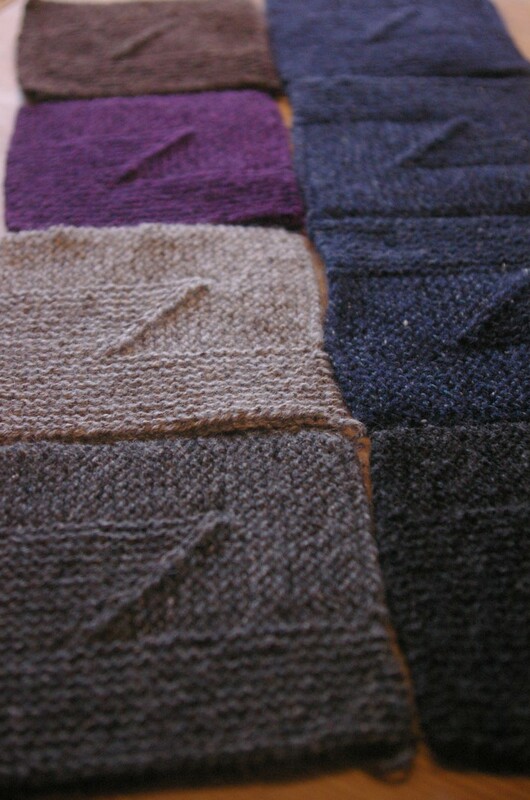 Categories: FO's, New, Spotted in-store and out | Tags: knitting, Shibui, Sunspun | Permalink.